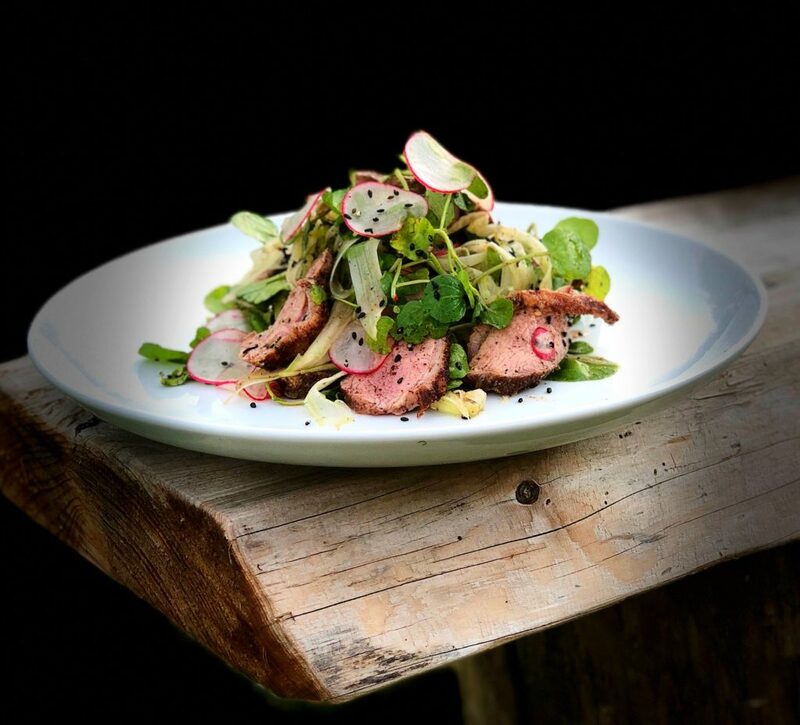 Today I have another recipe for you for Love Watercress it is my Japanese seven spice duck breast with watercress, radish and fennel with sesame dressing. The dressing is great in a variety of different salads. You can either make your own Japanese Seven spice or buy it ready made from a supermarket. If making your own Japanese seven spice, combine all the ingredients in a pestle and mortar and grind to a fine powder. For the duck breasts preheat the oven 190c. Score the duck breast lightly across the skin, this will help render and release the fat. You don’t want to go through too far here, you only want to cut the fat not the actual meat. Place the Japanese seven spice powder and a pinch of salt and pepper into a bowl. Add the duck breasts and toss until nicely coated. Heat an oven proof frying pan on the hob till hazing. Add the rapeseed oil and then place the duck skin side down in the frying pan. Immediately lower the heat to low-medium temperature and cook for 5 minutes. Once the five minutes is up turn the duck over and place in the oven for three minutes. Turn the duck back onto the skin side and cook for a further three minutes. Remove from the oven, take the duck breasts from the pan and cover in foil to rest and cool. Whilst this is cooling make your dressing. Grind the toasted sesame seeds in a pestle and mortar till well crushed. Add to a bowl with the rest of the ingredients and mix until well combined. Taste the dressing to make sure it is well balanced. Add more soy sauce/tamari if it needs more salt, more lime juice for acidity or chilli/ginger for heat. Start putting your salad together by firstly putting your dressing into the bottom of a big bowl. Finely slice the duck breast and add this to the bowl with the radish and fennel. Finally add the watercress and then mixed it all together until coated in the sesame dressing. Share between four plates and then sprinkle with extra sesame seeds.